Tom, Tom, down in the dumps? 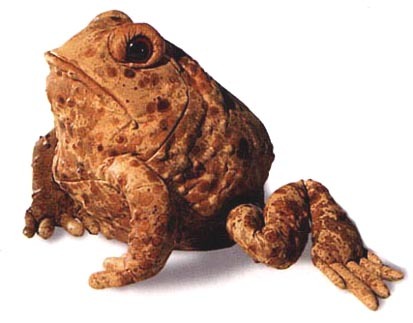 Who's that there, all warty and lumps? It's my long-jumping buddy, Uncle Bumps. Clearly the ONLY cure for the hangdog blues, Uncle Bumps repositions the shoulders (yours) for a comfortable ride (his), and hops aboard. he is not to be outdone in the post-to-post pass, and spirals with the best of them over the covers and through the woods. Familiar with the humors and mood of females as well, Uncle Bumps is equally comfortable having secrets whispered into his anatomically correct toad ears and having ribbons of joy draped over his batiked body.